Automobile spark plug - Visual Dictionary - Copyright © 2005-2016 - All rights reserved. [img]https://infovisual.info//storage/app/media/05/img_en/012 Automobile spark plug.jpg[/img] [url=https://infovisual.info/en][/url] - [url=http://www.infovisual.info/]Visual Dictionary[/url] - Copyright © 2005-2016 - All rights reserved. 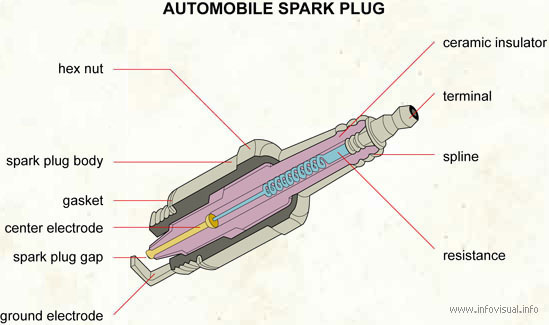 Automobile spark plug: electric part generating sparks to ignite an internal combustion engine. Ceramic insulator: pottery support for the parts that conduct electricity. Terminal: place where a current-conducting wire is attached. Resistance: device that controls the strength of the current. Ground electrode: current device that unites the electrodes. Spark plug gap: space separating the current conductors. Center electrode: central current conductor. Gasket: spot where two part join together. Spark plug body: metal part of the spark plug. Hex nut: hexagonal piece of metal used to screw in a spark plug.